Uber drivers held a demonstration in central London on Tuesday, to protest against the company’s treatment of its workers. 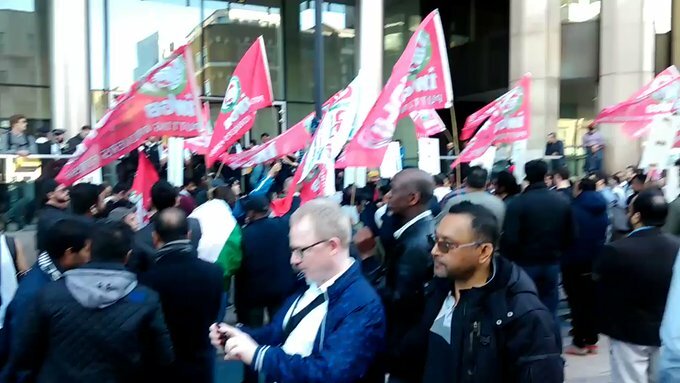 Around 100 demonstrators gathered in front of the firm’s headquarters in Aldgate, demanding higher wages and better working conditions. Uber needs to “lift drivers out of poverty and to [grant employees] the London living wage”, said Chair of the United Private Hire Drivers branch of IWGB (Independent Workers Union of Great Britain) James Farrar. The protest was part of a nationwide demonstration, which also took place in front of Uber’s offices in Birmingham and Nottingham. It is demanding a fare increase to £2 a mile, a reduction in commission paid by drivers to Uber, and an end to what it calls “unfair” driver deactivation. An Uber spokesperson said the company stood by its pay record, adding that it had introduced sickness, injury, maternity and paternity protections “over the last few months.” The firm did not say how the strikes would affect its service. In a separate protest on the same day, UberEats couriers, Uber drivers and supporters temporarily occupied the lobby of Uber’s London headquarters. This is following a series of 3 similar Uber log off strikes in Australia September 2018, organised by Ride Share Drivers United (RSDU), with the last strike taking place 5th September, named “Fast 4” an international 4 hours log-off strike launching simultaneity in Australia, USA, UK and NZ. Uber was recently valued at $72bn, making it one of the most valuable privately held firms in the world. But the company’s expansion into food delivery and bike sharing have eaten into recent earnings. Next Post:Follow us on Twitter to stay up-to-date.